Recipe: Heat the oil in a large skillet over high temperature and saute the garlic, onion, ginger and diced vegetables for 3-4 minutes. Add the mussels and when they start opening, deglaze with the white wine. Add the chicken base and oyster sauce two minutes later and cook for another 3-4 minutes to reduce the sauce. At the end remove any unopened mussels and add the fresh cilantro. Serve the oriental mussels in a bowl and pour the sauce over them. I created this mussels recipe for a tapas bar with some fusion influence, and it has been a tremendously successful item in the menu ever since. 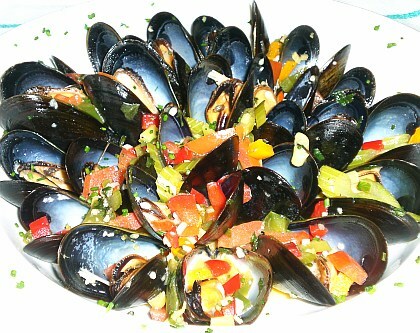 See my other mussels recipe, here.